Flooring is a big investment, and you want to make sure to care for it properly. Before we purchased this house, we had old carpet and linoleum flooring, so we didn’t have to worry as much about such things. When we purchased our Luxury Vinyl Plank (LVP), we had to make a few other purchases to make sure we didn’t do anything to damage it. 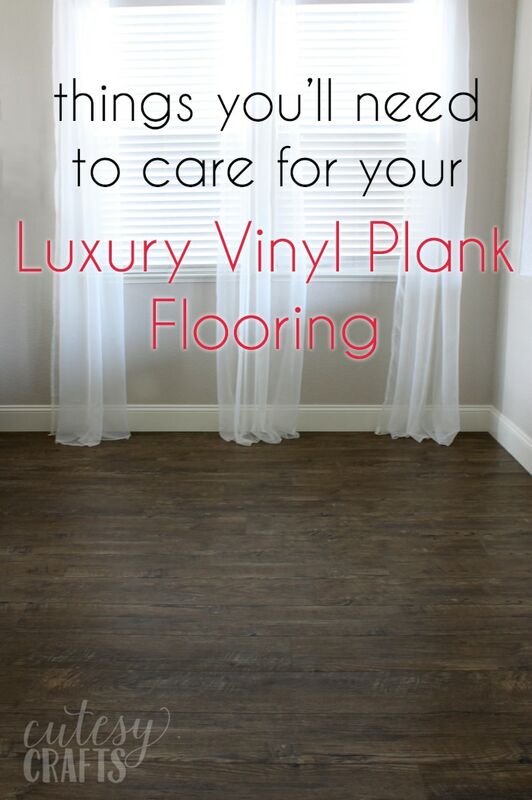 I thought I’d share my list of things you need for your Luxury Vinyl Plank flooring. Hopefully it will make finding everything that you need for your floor easier. This is what I found works for the flooring we installed. Read the care instructions that are specific to your flooring to figure out what is best for you. I am not responsible for any damage caused to your flooring. Chair Pads – One of the first things we did after we got the new floor was put felt pads on the bottom of all of the chairs. I knew from experience that sticky pads would not stay put for long, so I looked around for something better. I found these highly rated pads on Amazon that you easily nail into the legs of your chairs. I’ve been using them for over a year now, and they are the best! Sticky Felt Pads – It probably wasn’t 100% necessary, but I still felt the need to put felt pads under all of the furniture even if it didn’t get moved around a lot. I bought these large pads and then just cut them smaller to fit my needs. They will definitely come off any furniture that gets moved (chairs), so I don’t recommend them for that. Anti-Slip Pads – This might not pertain to you, but we have a sectional sofa that doesn’t have a wall behind one part. It slips and slides apart on the hard flooring, and it was driving me insane. I bought these little pads to put under each of the legs on the sofa, and they work surprisingly well! It will still move if the kids jump on it with a lot of force, but for the most part, my sofa is now stable. Such an easy solution to stop my sofa from sliding! Have you ever used a rubber-backed rug on bathroom or kitchen linoleum and had a yellow spot appear underneath? No matter what cleaner you use, the yellow spot won’t go away! That’s actually caused by a reaction between the linoleum and the backing on the rug. Apparently the same thing can sometimes happen with LVP. Rather than buying rugs with a backing already attached, I bought rug pads to go underneath. Make sure to get ones that say they are safe for vinyl flooring or say something about non-yellowing. I have to be honest here. I don’t remember where I found mine. Possibly Bed Bath and Beyond? It was difficult to find anything that specifically said it was safe to use. Leave a comment if you have suggestions. I hate sweeping. With four kids running around, someone is always leaving crumbs somewhere, so it can’t be avoided. In my old house, I used this electric Swivel Sweeper that I absolutely loved! In fact, all of my friends bought one because they loved it too. Haha! With the LVP, you aren’t supposed to have anything that has a beater bar on it though. I bought this vacuum that has an option to use it without the beater bar turned on, and it’s just okay. We have to use this thing to unclog it sometimes. My sister has a Dyson that she loves for her hardwood floors, but I can’t quite come to terms with the price tag on those babies. The care instructions for my LVP say to use a neutral cleaner. Being extra cautious, I’ve been using Bona Tile and Laminate Floor Cleaner with a damp mop. The guy that installed my floor said I could just use a mixture of vinegar and water, but I have yet to try that out. I’ll probably go that route once I go through my bottle of Bona. One of the great things about my floor is that you can’t really tell when it’s dirty, so it doesn’t get mopped much. Four kids… remember. Haha! You don’t want to use anything that will scratch your floor, so something soft is good. I use something like this mop to clean mine. I get it a little damp, spray the Bona floor cleaner on the floor, and then wipe it away. So far so good. This may not apply to you, but one of my biggest fears with the Luxury Vinyl Plank was moving my giant piano in without damaging the floor. We put boards across the floor and very carefully (with 4 people) moved it into the house. I bought caster cups that distribute the weight of the casters (wheels), and we haven’t had a problem. Of course, I have yet to move the piano again to see what the floor looks like. When I originally wrote this post, we hadn’t moved our fridge since getting the new flooring. Well, the fridge sprung a leak, and we had to move it to fix it. I’m so grateful that we had vinyl so the floor didn’t get ruined from water! However, I did notice there are dents in the flooring where the front wheels have been sitting. That’s okay for now since we just put it back in the same spot, but what about when we need to replace the fridge someday? I’m not really sure what the solution is here. Maybe some kind of caster cup like the piano ones? Not sure how you would get those under a heavy refrigerator though. If you’re reading this and have any bright ideas, please let me know! My internet search hasn’t turned up any results. One last thing that I need to throw in there. My son is obsessed with his ride-on fire truck and spends a large part of the day driving it around the house. I started to notice small scratches in the clear coat of the floor, so I cut up a pair of old socks to put on the wheels. I found this YouTube video that explains how. You can also buy some covers like these. Well, that’s all I’ve got for you. Hopefully this was was a helpful post. 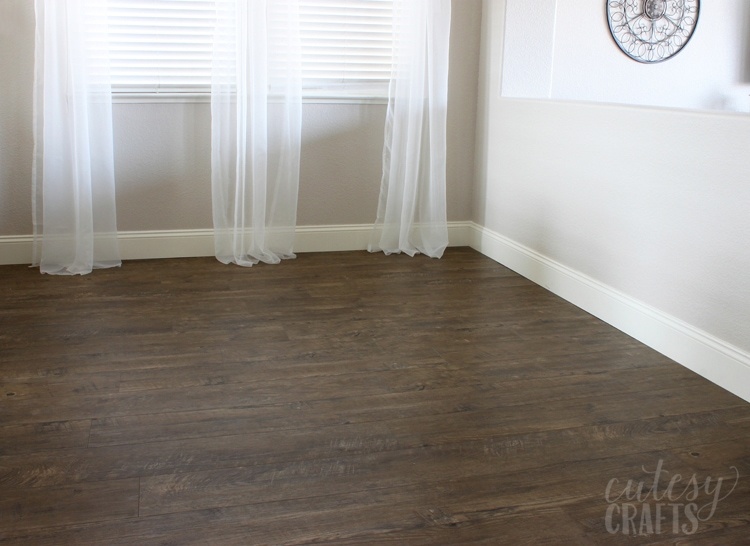 If you are curious about my flooring, you can find more on my Unbiased Luxury Vinyl Plank Review. You can also see how my floor is holding up by reading Vinyl Plank Floor Review – Two Years Later. If you have any other suggestions, feel free to leave them in the comment section below. 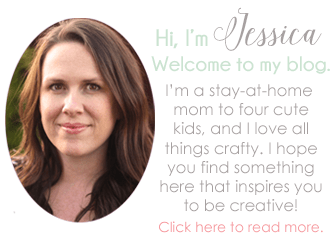 Hi Jess, I was wondering if you bought and used the extra ‘sound underlayment’ when you laid your LVP??? Great posts, btw. Thank you. Thanks! I’m not sure what my installer used for underlayment, but he did say it would block sound. It was also foil-backed and had moisture protection. Sorry I can’t be more help than that. I live on the 2nd floor & was replacing carpet. My friend installer recommended putting an extra underlayment of cork. Only added about $1/sf to the cost, worth it as I hear very little from downstairs. I was wondering, though, about the texture wearing…any problems. What kind of guarantee/warranty. I haven’t had any problems yet, and I’ve had the flooring for almost two years. The flooring comes with a lifetime residential warranty, but I’m not really sure what that includes. Great blog post. We are having LVT installed in our two bedrooms. We have 2 dogs so durability and easy maintenance are mandatory and appearance important as the rest of our antique home is hardwood. Do you know what mil your wear later is? Trying to settle on a realistic level without breaking the bank. Thanks Sabrina. Looks like the one we chose has a 20mil wear layer. It’s for residential to heavy commercial use. Wow Thanks so much for such a wonderful and thorough report. I have been agonizing about weather to get LVP or tile and I too am very concerned about the health of my feet and joints. I am wondering if you had any worries about the off-gassing or environmental health concerns with the vinyl. As although it looks beautiful and will wear well I am concerned about the possible toxicity. Thanks again I especially loved your advice about the piano, one of my other big concerns was denting the vinyl. I had a lot of smells going on in my house from new carpet and paint at the time, so I don’t know how much the floor contributed. If you look at the other comments, you’ll see some other people that were concerned as well. This brand is floor score certified, which is supposed to mean that you don’t have to worry about that. Such a wonderful and thorough report. I am wondering if you had any worries about the off-gassing or environmental health concerns with the vinyl.Thanks I loved your advice about the piano, one of my other big concerns was denting the vinyl. So glad you like it! I don’t know if there was any smell because we got new carpet and paint all at around the same time. The flooring is supposed to be floorscore certified, which means it meets air requirements, but I don’t know what all that entails. Great article! Still trying to figure out the rug piece myself! Thanks! Thank you so much for this article! It’s been extremely helpful. I have two dogs and one is a male who occasionally likes to mark so I do want waterproof flooring. I don’t really want tile because it’s cold and hard. However, I’m concerned about the expense of getting area rugs and mats for vinyl because they can’t have rubber backings. I will have to replace all that I have now. Also, I have two chairs with rolling legs. One is in my office on a plastic mat (with the bumps underneath). Apparently, I can’t use that mat but do I even need one on the vinyl? Will the rollers on my office chair hurt the vinyl? I purchased the felt pads and will be getting a dust mop (microfiber/chenille Quickie). Ikea has different types of felt rug pads at a reasonable price. So glad my article was helpful! I would definitely try to find rugs and mats without the backing. Make sure anything you get says non-yellowing or that it’s safe for vinyl flooring. I wonder if you just put different pads under the rugs you already have if that would block the rubber from touching your floor and stop the reaction? I would still recommend using a mat under your chair. My son drove his ride-on car around the house, and little scratches did start to appear. They sell different kinds of mats that are made for hard flooring. Just make sure they don’t have any chemicals in them that will yellow the floor, like the rubber mats. Thanks for the tips about Ikea! I’ll have to check those out next time I’m there. I very much dislike the luxury vinyl plank flooring that is on three of our floors — dining, living room and kitchen. Nothing that I’ve tried cleans off the grease or gunk from the kitchen floor. There is virtually no shine to the planking, so it is dull looking, besides looking fake. If you don’t mop in the direction of the planks, it shows and looks smeared. Oh how I wish we’d had another type flooring installed. Oh I’m so sorry to hear that! I’ve heard the same thing from a couple other people. I wonder if the color/pattern and/or brand make a difference with this problem. It’s good to hear a different perspective, so thank you for sharing! Can I ask what name brand flooring you used and what color your planks are in the pattern? I’m glad you found it too. I hope you love yours as much as I love mine! Oh, thank you so much! I couldn’t find any information when I was looking, so I’m glad that I’m able to help out! I plan on having LVP installed in November. What can I put under the heaving furniture to prevent denting? I use caster cups under my heavy piano. They help distribute the weight of the heavy furniture. I believe they also sell some for appliances, beds, etc. I sadly am very unhappy with the LVP I bought from (big box store name omitted). I had relatives who are in the business install it. I have shiny spots that don’t wipe out. I have unexplained scratches. I have a 43# poodle golden mix who is 10 years old. She is terrified of the floor and has slipped and fallen a handful of times. I got boots for her otherwise we tried throw rugs but she scrambled from rug island to rug island. I have scratches from her even though I have her nails trimmed regularly. The floor does not look clean even after using recommended products. I enjoyed it for about 3 weeks and now it is a major chore. When I called the store they gave me my warranty info and told me to call the manufacturer. No ownership. I have pics showing the issues. Oh no, that’s horrible! I’m so sorry you are dealing with that! I’ve heard from a couple other people who said the same thing. Scratches and cleaning issues. 🙁 Thankfully, I haven’t had any of those issues with mine. I watched my sister’s dog for two months too. I think it must really just depend on the brand and color. I did omit the company and brand name from your comment just because I don’t want to get in trouble, but make sure you leave some bad reviews on their site. Include the photos too. Hopefully that will help people steer clear from that brand. Best of luck getting them to take some ownership of the problem! I would say no to both. The plastic might scratch the floor, so I would recommend felt. When I read the instructions on my flooring, a steam mop was a no-no. The heat can damage the floor. Every brand of flooring should have its own care instructions, so I would read those when considering what to clean it with. I am looking at flooring right now. Glad I found your information. Where did you get yours from? Did you order it online? I have tried to find a distributor near me and can’t find a way to look that up? Can you give me some insight? I got mine from a local flooring dealer in my area. That’s part of my frustration with this product, that they don’t have much information available. I’m sorry I can’t be more help. I tried to contact them to get a list, but it proved pretty impossible. So glad I came across this. We just got LVT installed and I love it (but concerned we will damage it!). Really appreciate your great tips. Being extra cautious, I think I would put some kind of mat under the chairs. They sell mats that are for hard flooring. You just need to make sure they don’t have any chemicals that will yellow the vinyl, like the rubber backed rugs. We had approximately 1300 sqft installed this past summer. Total cost was around $5700, which included install. Ours look very similar to yours, wide planks in a darker brown. We are very happy with them, but for the knowledge that they can be damaged by both scratches and/or water. For us, hardwood was not an affordable option. We don’t like tile of any kind (except in bathrooms). Laminate has its own issues with water (and we feel they are more water risky). So vinyl it was. I clean them with a Libman Freedom spray mop, using only water. The spray is very fine, and I mop until the head is near dry before spraying more water. No problems. We’ve had VERY minimal scratching over the course of 6 months. A few caused by careless kids, and not very visible. One indent caused by a water heater being removed on a dolly. We don’t allow any shoes in the house (tiny stones or debri caught in the soles would damage the floors). And we have rugs at all entrances. I’m in the process of buying a rug pad for an 8’x10′ rug. Very few pads claim to be safe for all surfaces. Eco friendly pads seem to be the exception (generally, felt construction.) They’re not cheap, so folks should keep this in mind when considering area rugs. There do appear to be some rugs which have soft backing, which might not need a pad. For the record, I do love our floors and would purchase wide plank vinyl again. Thanks for the added information Toni! I’ll have to look into getting a spray mop. That would be nice to not have to spray from a bottle. Most of the rugs I got have a soft backing, but then they slip, which drives me crazy. Haha! Thank you and your commenters for the insights into LVP flooring. I have been researching this for several months trying to decide if this is the right flooring for us. Six people in the house, two of them 5 year old and 2 year old grandchildren, plus 2 small dogs and a pool. This is why I am leaning towards the LVP flooring. I have a question about installation. We intend to hire it out. Did you find your own flooring installer or did you purchase installation from your retailer? If you found your own, did you use an online search for flooring installers? Reviews I have read that were negative were by far due to installation issues so I want to be careful. We used the installers that our retailer had. The retailer was actually a design/remodeling type of shop, so they do all kinds of things. I would ask some people in your neighborhood or that you know for recommendations. Our installers did a great job, they just neglected to inspect each board for defects. As a result, we have a couple boards with defects in them. Not super noticeable, but it’s annoying. We are moving into a home with LVP throughout all 2,400 sf. The previous owners have provided me with the floor type, but I can’t find anything about it online. I have a solid wood farmhouse dining table, which is very heavy. The way the legs are made, I cannot place casters underneath them, so do you think the large, cut to size, felt pads will protect the floor enough? The LVP is Classic Collection, Olde Hickory, SSP-9702 Derringer. I’m not sure. I put my dining tables on the floor with no problems, but they might not be as heavy as yours. It might depend on the type of floor and how wide your table legs are. The wider the leg, the more evenly the weight will be distributed. Sorry I’m not more help. Just installed LVP and have put felt pads under everything except the buffet in the dining room which has casters. Do you think these will scratch the floor? It is not moved very often. Thank you for your opinion. How heavy is the buffet? You might want to put some caster cups under it to distribute the weight. I would be more worried about that than scratches. We put them under our piano, and so far no problems there. They have felt on the bottom, so we can slide it a little. We just moved our fridge last week after it sprung a leak, and I noticed two dents from the front wheels. 🙁 Hopefully I can save you from the same fate. I’m not really sure what you are supposed to put under a refrigerator though. The people that installed my floor said it didn’t need anything. This is really good information. Thanks for sharing. We are putting down the LVP flooring and I am getting conflicting stories. My brother and contractor plus neighbor say you do not need to put anything under your furniture. The website for the LVT has all kinds of things you need to do with your furniture to protect the floor. I really need to know the best thing to do. Mom uses an walker so chairs with felt may slip from under her. Laundry will have the LVP. Do I need one of those trays under each, and also concerned about the feet scratching the floor if the washer ‘walks’. Rollers on a desk chair-do we need some kind of non rubber plastic mat? Where do you find such a thing? Also, it has been really hard finding nice rugs that are material on both sides. What about heavy desk? So will the felt really slide that much under heavy furniture? Your input would be appreciated. I would definitely protect the floor from your furniture. I’ve heard stories from other people about theirs scratching, and mine did start to get little scratches from my sons ride-on car and some chairs. The felt pads under the chairs don’t really make them slide around, especially if the chairs are heavy. They definitely still have resistance when I push them. I’m not sure about the washer and dryer as we have tile in our laundry room. I think they make mats to put under rolling chairs for hard flooring. You just need to make sure it doesn’t have chemicals that will react with your vinyl. My large rug has that scratchy backing on one side. I put a pad underneath. You just want to be careful with rubber-backed mats since they could yellow your flooring. Oh, I didn’t even see that in the ones I linked to! The ones I bought had felt on the bottom. Thanks for pointing that out! I was just curious, I saw you got rubber pads to keep your sofa from moving. I was under the impression rubber would discolor vinyl plank. Did this happen under the areas you placed the rubber pads? I haven’t seen any discoloration. I’ve moved the couch a few times for cleaning, but I haven’t really inspected the floor closely. I just trusted the reviews and the description that said they were safe for vinyl. I don’t know if reviews on Amazon are worth much anymore though.